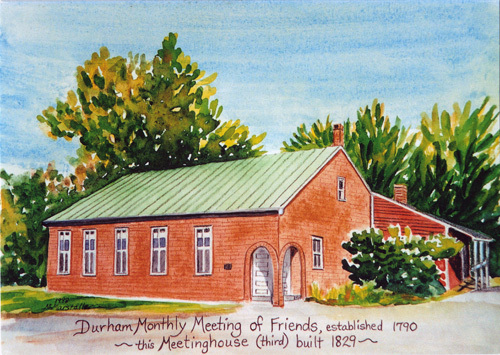 Durham Friends Meeting is a welcoming faith based community rooted in the principles of the Religious Society of Friends, the Quakers. As Friends we hope and expect God is still speaking to us, still giving us guidance. We seek to create and support communities where Friends’ testimonies of peace, equality, simplicity, integrity and community can flourish. It is our hope and responsibility to create a world of social, economic, racial and gender justice. Our worship is a bit unusual even for a Quaker Meeting or Church. We have a good deal of quiet, waiting worship in which we gather in silence. People speak out of that silence if and when they feel led to speak. We regularly begin with a singing of hymns suggested by those present, we have a call for joys and concerns, a youth story, and a prepared message given usually by a member of the Meeting. More waiting worship follows the message. Our worship is open to all. We have been worshipping together here since 1775, but many of us have only recently arrived. We are seekers after the truth. We have no creed or official set of “truths” we expect everyone to believe. The Durham (ME) town website has a brief history of Durham Friends Meeting. We are a member of New England Yearly Meeting, which in turn is jointly affiliated with both Friends General Conference and Friends United Meeting. Quakers around the world stay in relationship with one another through Friends World Committee for Consultation. Maps of the Jones and Lunt Cemeteries maintained by Durham Friends Meeting, 2004.